My last post attempted to answer a question I had been anticipating for about one year: Why doesn't Santa Claus visit Ethiopia? After all, if Santa visits 'all of the world's good boys and girls and brings them gifts', then why, for the past ten years, did he not once make a stop at our son's home in Ethiopia? Simple question, not so simple answer. I am a planner, so long before our Ethiopian blessings arrived home, I began to look critically at many of our customs, traditions, and celebrations and ask, "Why"? Why do we do this or that? What does it mean? Most importantly, is the way we celebrate consistent with our faith? Consistency is huge for me. It probably has something to do with my friend-diagnosed 'messy head syndrome', but also because in my life the teachers I am apt to follow are those whose actions and life match their words. Those who lead by example, even when it is not convenient. How did we want to lead our children? So, a decision we felt that needed to be made this year was whether or not we should hop off of Santa's sleigh or ride it with the best of them? What does choosing either of those two alternatives mean to our family, to your family, to our faith, to our convictions? As I said previously, I have always enjoyed hearing the original story of Saint Nicholas because the authenticity and simplicity of the message was unmistakable. But, where did this whole idea of an costumed, sleigh-riding, gift fairy originate? If Christmas is about the birth of Christ, how did we get from there to here, here being a season where we claim Jesus is the reason, yet may wind up using the majority of our energy stressing about everything other than preparing our hearts for Jesus. No wonder we get get confused about the true meaning! Yet, even if we admit and profess that Jesus is the gift, I would guess most of us still feel some sort of pressure in the Christmas consumer department. Why is that? Nicholas was an early church leader, a 4th Century bishop in Myra, which is current day Turkey. He worked for justice and cared for those in need. In 987, upon his conversion to Christianity, Price Vladamir I brought St. Nicholas with him to parts modern-day Russia, the Ukraine, and Belarus. St. Nicholas becomes Russia's favorite saint. In the middle ages, we witness the transition to Sinterklaas, who arrives in the Netherlands along with a new twist on the story . 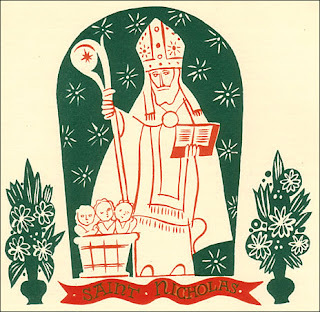 In 1809, Diedrich Knickerbocker's History of New York describes St. Nicholas as an elfin Dutch burgher, not a saint. This begins the emergence of a distinctly American figure. That is a neat timeline of St. Nicholas, but I have yet to figure out how and why we began celebrating the generosity of St. Nicholas on Jesus' birthday? Anyone? The best I could come up with as a possible answer is that the Roman pagan celebration of Saturnalia, a debacherous event that carried on between December 17th and 23rd and involved gift giving, may have merged with the early church celebration of Jesus' birth in order to keep the peace. The idea of giving gifts to one another because the three wise men brought gifts to Jesus is a neat story, but the early church did not really celebrate Christmas, they observed Christmas. In my mind, we seem to have possibly merged a pagan feast with the observance of Jesus' birth and also merged the feast of St. Nicholas with the birth of Jesus. So, that is all great and wonderful; however, how do we or don't we celebrate Christmas in 2011 middle-class America? We are not monks and I very much enjoy being part of society and interacting with people. After all, Jesus did tell us to, "Go out." However, I absolutely do not agree with the commercial aspect of the holiday. It seems counter intuitive to the very nature of Jesus. In my last post, I stated that we were hopping off of Santa's sleigh. Cut and dry, we were going cold turkey. Sayonara, Papa Noel! Well, that was easier said then done. Yes, we have been detoxing from Santa and beginning each day talking about preparing for Jesus' birth. A few times per day I remind the kids and myself that Christmas is a celebration of God incarnate and not Santa or gifts. We are intentionally talking about the humble, simple, and generous life Jesus lived and how it was most important to him that we care for the poor, sick, and needy. In short, we are focusing on giving to those in need and not receiving. First and foremost we are giving gifts to Jesus by following Matthew 25 "Whatever you did for one of the least brothers and sisters, you did for me." Now that, my friends, seems consistent with how our family wants to celebrate Jesus' birthday. Our first present to Jesus was to become a sister to an HIV+ mother in Ethiopia. We will become friends, but even better, she will receive the medication and holistic treatment she needs to live healthily and see her kids grow. We want our children to enjoy the magic of the holidays and celebrate Jesus, but also want to warn them about not living by the world's standards, but by God's. A funny thing happens when you pull Santa from Christmas. The world still reinforces him. Mommy says Christmas is not about Santa and furthermore Santa is NOT watching you while you sleep. For crying out loud, we receive enough middle of the night visits, we do not need our kids thinking anyone is watching them. However, friends, teachers, strangers, and people everywhere will reference Santa to our kids when out and about. Just the other day when I picked my littles up from preschool, they exclaimed, "Guess who called us today at school? Santa!!" Then, on the way home a motorcade fit for the president drove by....escorting none other than, Police Officer Santa, in full Santa garb riding a motorcycle while honking and waving to everyone. It was cute, but again, what does Santa have to do with Jesus? None of this stuff bothers me, because like I said, I like to be part of society, it helps keep everything in perspective for me. I believe it is also consistent with the Gospel. How do we witness to to others about Jesus if we are holed up, blackballing everyone and everything we disagree with. Some of my closet friends are people of different or no faith. I would like to be a good, faithful witness to them and others. All of these encounters out and about give us something to talk about when we come home, together as a family. Isn't that what parenting is all about? Teaching our kids what we believe to be important and necessary in this life. I am beginning to realize that Santa is just another player (and innocently costumed figurehead) in our consumer-driven, possession obsessed society. Will removing Santa solve the bigger problem of over-consumption? Probably not, but it could be a start. At the very least, I hope that it helps our children to become critical thinkers so that when bigger inconsistencies and questions of faith arise in their life, they can pray and think through the situation and hopefully have peace with their resolution. My hope is that they will ask questions, that will no doubt annoy their teachers, about why we celebrate this or that holiday a certain way. Saint Nicholas certainly was a kind and generous man looking out for the poor and oppressed. However, I am still not making the connection with celebrating him on the birth of Jesus, our Lord and Savior. As the day draws near, we are looking forward to celebrating Jesus' birth by giving to the poor and oppressed. I am very excited about this new tradition and sharing with our children what our gifts mean. How does Santa fit in to your Christmas celebration? What are your thoughts on how St. Nicholas became Santa Claus and how that transition may have changed the holiday's initial meaning and intention? All opinions respectfully welcomed!